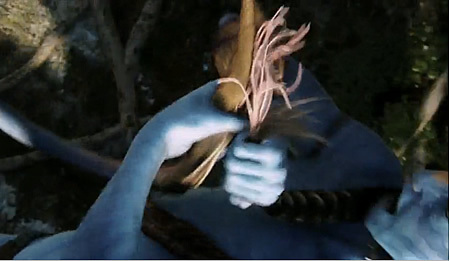 In James Cameron's hit movie Avatar, the Na'avi people of Pandora are able to "bond" with other creatures on their world. They do this by allowing the fine fibers at the end of what looks like a ponytail intertwine with the equivalent fine fibers on different animals. There is some research to suggest that bacteria living in ocean sediments connect to each other by a network of microbial nanowires. Researchers believe that these fine protein filaments move electrons back and forth, allowing a community of organisms to act like a single entity. "The discovery has been almost magic," says Lars Peter Nielsen of Aarhus University in Denmark. "It goes against everything we have learned so far. Micro-organisms can live in electric symbiosis across great distances. Our understanding of what their life is like, what they can and can't do - these are all things we have to think of in a different way now." Nielsen and his team took samples of bacteria-laced sediment from the sea floor close to Aarhus. In the lab, they first removed and then replaced the oxygen in the seawater above the samples. 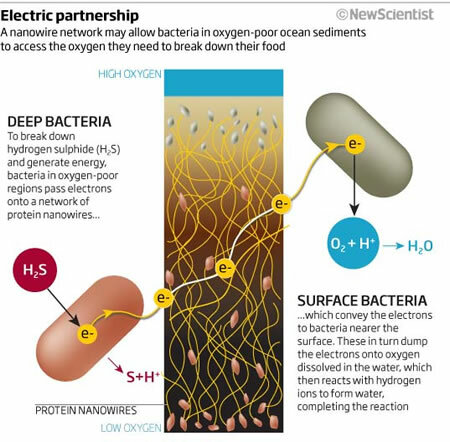 To their surprise, measurements of hydrogen sulphide revealed that bacteria several centimetres from the surface started breaking down the gas long before the reintroduced oxygen had diffused down to them. Nielsen believes a network of conductive protein wires between the bacteria makes this possible, allowing the oxidation reaction to happen remotely from the oxygen that sustains it. The wires transport electrons from bacteria in deeper, oxygen-poor sediments to bacteria in oxygen-rich mud near the surface. There, they are offloaded onto the oxygen, completing the reaction (see diagram above). Nielsen calls the process "electrical symbiosis". From Nature via New Scientist; see also a short video of Avatar Na'avi bond formation. Thanks to Vik for pointing this story out.